Interests - music, Westlife, Boyzone, swimming, going on holiday, Dr Seuss books, Disney, colouring (but not with felt pens). 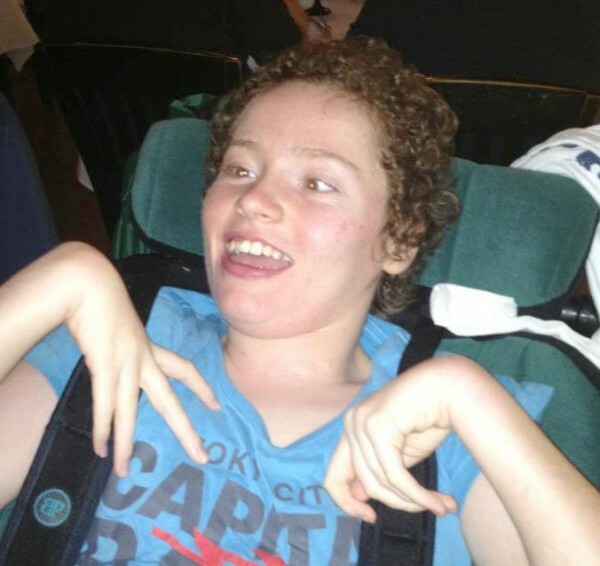 Bethany was diagnosed with cerebral palsy when she was nine months old. She was a premie baby born 8 weeks early. She was then diagnosed with epilepsy and registered blind before her first birthday. In 1998 she had a peg fitted to feed her through and then in 2000 she had surgery on her left hip. After surgery she suffered 3 fractures to the left leg. She was diagnosed with Osteoprosis. In 2001 she had surgery on her stomach to stop her vomiting, in Great Ormand Street. Then in 2003 she had surgery on her right hip which sadly did not work and left her in a lot of pain. She had surgery on the hip again at Bristol Childrens Hospital in November 2004. She will be back in in December to have her cast removed and hopefully find out that the surgery has worked, although she will be prone to fractures for twelve months. Bethany is a happy go lucky girl. She never complains about any of the pain she is in. Bethany doesn’t have use of her hands, but can pass small objects. She has visual optic nerve damage and is totally dependant on carers. Bethany has had six years of surgery and we are hoping she does not have to undergo any more. Her epilepsy is starting to cause a real problem at the moment. They are bigger and last a lot longer than before. She is still a great Westlife fan and just the mention of Mark’s name makes her go all giggly. Life is getting harder in the fact that she is much bigger and not having every thing to hand when we go out or away makes life difficult. She still needs to attend Bristol Children’s Hospital and Frenchay for regular check ups. Her right hip seems to be popping in and out of its socket which is a real pain as she had a operation in 2000 to put it back in. We will leave well alone as it does not seem to be causing her much pain. She has an eye for the boys at the moment and is very cheeky. I think it is time for Beth to move on from Post Pals now. She is 18 and although she is still having health issues, I just think she is growing into a young lady who is more into her TV, music and boys. We can never thank you all enough for the wonderful cards and gifts she has received over the years. We have made great friends with a lovely American lady who we will always have contact with. I would like to thank everyone that sent post for her birthday, Christmas and world book days. You are all great and I wish you every luck in the future. We have had quite a few issues with Beth over the last few months. For some reason Beth has stopped eating enough for her to get all the nutrition she needs. She is now being pump fed. Her VNS was turned back on as we had no choice due to no medication working for her seizures. Sadly the last ramp has made her voice slightly croaky again and liquids are a slight issue as she is coughing yet again. It sounds like the VNS is causing these issues as I had thought in the past. Where we go now I am unsure. On a happy note, Beth is going to Orlando to celebrate her 18th, where have those years gone to. She will be flying upper class as she does not sit well enough for economy. We decided it was her 18th and she is hard to buy for so why not. We will be out there for 3 weeks. Beth is having a few problems with seizures at the moment. She seems to have stopped eating as much so is being topped up with peadisure as weight is falling off her. We are all struggling with the school holidays and the process of her going from children to adult services. Sorry for late updates but it is manic here with Beth transferring to adult services this year. There is so much work to be done. It worries us that we will miss something. Beth is fine. She is still having the odd seizure, but has had a good couple of months. We are all looking forward to school holidays so we can chill. We are planning for her 18th birthday at Walt Disney World. Beth has a real treat with flying upper class. This is because she can not fly economy any more due to poor balance and so we need her to lay flat. That’s not until November, but she has lots of theatre shows to see that will keep her going. Beth has had an ok month. We’re still waiting for tests to be done for her problem with swallowing liquids. We are run off our feet with appointments for her transition to adult services. It’s hard going. Beth has had quite a few seizures this month. She needs to under go some tests due to her being unable to swallow liquids. Her vns has now been turned off and she will start a new medication soon. Beth has been having some side affects with her VNS and we really need to chat to the doctors about it. We’re not sure yet what they will do, but we have basically had enough of them as they are not fair on her, so we may request they turn it off. This will be a real disappointment. She has had some seizure activity too this month. Bethany has had her surgery to re-site the VNS. Sadly and as usual, all did not go to plan. Firstly, they could not find a bed for her even though we were half way there (phoning after 11.30am and being there by 2pm is not possible from Cornwall). We decided to carry on and would go shopping so not to waste a journey. Before we left, her respite home had said she was not too happy about being moved, which was suspicious. When we got to the new shopping centre we went to change Beth and when we moved her she screamed very loudly. We made a visit to the children’s hospital to be told she was too old by a week. We went straight to BRI and i must say they were fantastic. They did lots of tests and said they thought the femur was catching against the pelvic socket again. We then had a call saying they had a bed at Frenchay for her. BRI contacted Frenchay about giving Beth a nerve block whilst she was under and they agreed, but when we got there they said she was too complex. Thankfully we have not seen a problem since. It’s a bit strange, but we are counting our blessings. She had surgery the following morning which should have taken 1 1/2 hours but it took 4 hours. We were all concerned; apparently the wire had broken so they had to redo the whole procedure from scratch. They then had her in recovery for 3 hours as there was no bed for her. We were finally allowed home the same evening, although it was rather late when we did get home. Anyone that spends time in hospital will understand the urge to leave no matter how far you have to travel. Bethany then developed an infection in two of the three scars which cleared up with antibiotics. Sadly the scars look like train lines and we are not happy. The VNS is still switched off and we are waiting for them to turn it back on. We have to start from the beginning again which is a pain. She has also had some bad seizures over the last three days. We are going to Bristol again on Wednesday for an outpatient appointment to check her spine. We would like to thank Post Pals, Marcene, Julie, Judith and Clare for all the lovely gifts Bethany has received for her birthday and Christmas. If there is anyone i have forgotten i am very sorry, but a big thank you to you all. Bethany went to spend sometime at the local college today. She was a little quiet but said she liked it. She is going into hospital in a week to have the VNS replaced to where it should have been put in the first place. She is also looking forward to her birthday on Monday; i can not believe she will be 17. Bethany has had an ok month and her seizures are much the same. Bethany is having a problem with her seizures. We are going to Bristol in a couple of weeks to look at having the VNS put were it should have been to begin with. We have just had our first visit to Little Bridge House which is a children’s hospice. We had a lovely weekend and all feel a few pounds heavier. Sadly, two of Bethany’s cats passed away in September. They were both very sudden and unexpected. This upset Bethany a lot. Beth’s seizures have not been good at all. We also learnt that the surgeons put Beth’s VNS in the wrong place that is causing no end of problems. It looks like they will have to redo the surgery. Bethany has not had a good month due to really bad seizures. They are becoming quite worrying. She has just been offered a place at Little Bridge House. We are all looking forward to our stays there. Thanks for all cards and letters. Bethany has had a good month, although she has had quite a few seizures. Her vns has now been switched on although we are not allowed to use it until the middle of July. We have been to see Westlife in Cardiff and she had lots of fun at the concert. Bethany has now had her surgery. The VNS has been fitted and on the 20th June it will be turned on. Her spine is fixed which means she can not be straightened. This is good and bad. It’s bad as nothing can be done now but good as we do not have to make any choices and wonder if we chose right. Sadly the Westlife concert was cancelled to a later date but she did get to the Boyzone concert which she thoroughly enjoyed. It was hard work for me as she is getting bigger and it was uncomfortable for Beth due to such a long journey. This is now something that will not be possible in the future, which is quite sad but that’s life. Thanks everyone for your kind cards and gifts. Sadly, Bethany has had some more seizures and they have not been very nice. She will be going into hospital on the 4th of June to have a VNS fitted and for the orthopaedics to look at her spine. In the meantime, she has an exciting few weeks as she is going to see Westlife and Boyzone in concert. Thank you everyone for your cards. Bethany loves opening them. Bethany has not had too bad a month. She has had another seizure and we should be hearing any time now about having the vns fitted. She also had a visit to the dentist and they said her wisdom teeth are coming through. Unfortunately her body seems to have gone over again slightly so we guess this is her spine again. She was fitted for a new wheelchair which we collected last week but it seems too small for her. She is not happy sitting in it for very long so we are trapped in the house which Bethany hates. She is very excited though as she had Westlife and Boyzone tickets for Easter. Bethany seems to have had a settled month which is good as she has had a horrible time with seizures of recent. Thank you all for making Valentines day really special for her. We visited Bristol this week and sadly it was not good news. Bethany has pelvic tilt and the doctors are unsure why. What this means for Bethany we are unsure of. The doctors are going to having a meeting over this. Her seizures are still bad and we have had a new drug introduced for her. Only time will tell if it works. Bethany turned 16 in December. Where does the time go! I am sorry to say her seizures are not very good at all. She has to have rescue meds daily at the moment and this is not good. We have just come back from Orlando. Bethany loves it there, but sadly this was our last trip, as Bethany did not travel too well and had a lot of seizures out there. I would like to thank everyone who sent cards and gifts for Bethany’s birthday and Christmas. A special thank you to Marcene Lee, Kate Dee, Judith and Julie Barrettt. You have all been so kind to Bethany. Thank you. Bethany is having a lot of bad seizures at the moment. The doctors want her to have a vns, which will mean a small operation. There is a 5 month waiting list. She has been busy in school and we are going to Orlando on Friday for two weeks. Bethany has had some really bad seizures this month. Apart from this she is really happy and gaining the weight she much needed. Bethany has had a good summer holidays. We have done lots of day trips. We went to see Beauty and the Beast last week in Plymouth and she really enjoyed this. Sadly, her seizures are getting worse. We are going to see the doctor next week. Bethany has had some bad seizures this month. The doctor has now put her on the list for Vaguel Nerve stimulator. The list is about 18 months long. Apart from this she seems happy and is enjoying an all terrain buggy that Victoria and David Beckham bought her. We were able to take her right on the beach and she enjoyed hearing the sea. Victoria Beckham’s mum rang here tonight as we applied to the David and Victoria charity. They have agreed to buy Bethany an all terrain buggy for disabled. Bethany went to Bristol children’s hospital for some possible surgery on her right hip again. Thankfully the surgeon gave her an injection for pain relief which should last 6 months. We came home the following morning. We were all very relieved and happy. It seems to be doing the trick. She is in her school play ‘Shrek the musical’ this week. She will be Maid Marian. She had 1 seizure last week which was a shame as she has not had one in two months. She is in a really good happy go lucky mood at the moment and is looking forward to the long school holidays. Thanks to all for cards and gifts. Bethany is due to go into Bristol children’s hospital on 19th of June. The surgeon is going to put some dye into her hip to see what is happening. He will then decide what to do from there. We are not sure how long she will be in for. We have not told her yet as she will just worry. She has had a few minor seizures but nothing major. The doctors have started to reduce her epilepsy drug as they want to get her off it again. She has put on a little weight which is good news. Bethany has had to go to Bristol for an emergency outpatient appointment. She has had some pain in her right leg again. Sadly the bone has grown back, so we are waiting to go in as an emergency. They are going to have a look whilst Bethany is asleep. They think they will have to remove more femur and put her in traction. She has had a couple of seizures again. We’ve also been to London Wembley arena to see Westlife in concert. Bethany seems to be in some pain in her right leg again which is very worrying. Her eyes say it all when we move her. She has had 4 seizures. She is her happy go lucky self though. Bethany is doing so so this month. Her only real problem at the moment is her seizures which are really horrible when she gets them. She had 4 last week. She really gets upset with them. Apart from this she is really happy and cheeky. Thanks to everyone who sends cards and gifts to Bethany. They really make her day. Bethany spent a wonderful ten days in Orlando for her birthday. She really enjoyed all the rides although cat in the hat was her personnel favorite. We met up with Marcene Lee and Jennifer. We have not had so much fun and laughter in years. If we mention Marcene to Bethany she starts laughing. We met Marcene through this site. She met with her surgeon who operated on her back. He is very pleased with her and we do not need to go back until Jan 08. On a bad note her seizures have been playing up and she has had some really bad seizures. Her worst was on Christmas Eve. We would like to thank everyone for the cards and gifts Bethany received for her birthday and Christmas. A very big thank you to Marcene lee and Jennifer for coming all the way from Atlanta Georgia to Orlando and spending four wonderful days with us. For all the gifts you gave to Bethany, Lindsey and I. You are a true angel. We have just had a great holiday with Bethany in Orlando. She really enjoyed it this year. We meet up with Ms Marcene Lee who we meet through this site. Her daughter Jen came as well. We had great fun. Bethany is doing well although having a few seizures. Bethany is enjoying being back at school. She did have a large seizure a couple of weeks ago though. We are looking forward to going to Orlando at the end of November. We will be meeting up with Marcene Lee, a dear friend we meet through post pals. Her daughter Jennifer will also be joining us for 4 days. Bethany is great at the moment. We are really having a good spell. She loves every moment of school and is doing really well. All the doctors are happy with her. We are doing a drug reduction at the moment as one of the drugs is not working as well as it did. She is on a new one and we are hoping this will not cause a problem. Thanks all. Bethany is doing really well at the moment. She is looking forward to school and our upcoming holiday to Orlando later in the year. She enjoyed meeting Westlife and their concert. She sang and screamed all the way through. She was very quick to blow Mark a kiss and he made her day by kissing her on the check. Thanks Mark if you read this. You have made her truly happy. A big thank you to all who have sent things to Bethany, especially Marcene and Julie. Thanks to all who nominated her to meet Westlife. Bethany is doing really well. We can not believe she had major back surgery 11 weeks ago. She is so happy and all the doctors are happy with her. She won a contest to meet Westlife from our local radio station Pirate FM. Thanks to all that nominated her. Bethany is doing really well. She now has her new wheelchair and is back to school part time and she loves it. We are now able to go out for around 2 hours at a time which is great. Bethany is doing really well. She is still on some pain relief although we are reducing this. She is still not eating a great deal but this is getting better. We are going for a wheelchair fitting this week but will have to wait a month for it. We did buy her a special needs baby jogger on eBay and i must say this was a great buy although a tad too small for her. It will get us through this period though and i will certainly be looking at getting the next size up as they are so light to push. They are great on sand and uneven ground. Thanks to all who sent Bethany gifts and well wishes. We are looking at her doing some time back at school before the long summer holidays. We are really looking forward to life getting back to normal, what ever that is. She is going to see Westlife in concert in August. They are doing a concert in Falmouth. We are taking her to Florida in December as a birthday treat. We hope to meet up with Marcene who has been a great support to us all and a true Angel. We met her through this site and will now be long term friends. Bethany just spent 24 hours in our local hospital. She is severely constipated and has an ear infection. They were also concerned with her chest x ray. We are home again. I think we will get there but it will just take a little extra time. Just to let you all know we are home. The operation went well and Bethany seems to have grown 2inches. We did have a problem with her bowel as it stopped working. She spent 4 days in HDU. She was starved for 48 hours and thankfully the bowel started working. A week to the day and we are home. She is in some pain and her back is badly bruised. She has been a very brave girl. Bethany is very scared about her upcoming surgery. We do not know what to do for her to calm her fears. When we come home from hospital she will be stuck in doors for at least 8 weeks as she will need a new wheelchair. Hers will not be the right shape and due to her legs being different lengths an ordinary wheelchair will be no good. She had another major seizure this week; it lasted 3 to 4 minutes. She had a visit to the dentist which was very hard going; she will need to have two teeth filled and is on the waiting list for our local hospital as she needs a general anesthetic. This will be later in the year. Bethany will be going in on the 3rd May to have her operation on the 4th of May. Lots of prayers and TLC please that the operation goes to plan and that it does not get put back. Bethany is doing a little better this month. She is gaining some weight and is feeling a little heavier to lift. We have heard that her back surgery will be done by the end of June. We will keep you posted on this when we know more. Thank you again for all the cards and gifts. They truly put a smile on her face. Bethany has had some seizures and her weight is not too good. She seems to brew her seizures and when this is happening she really isn’t good and she just wants to sleep. Her scoliosis is getting worse too, she must be so uncomfortable sitting and when in bed. She is now back on pump feeds, we are doing this slowly to begin with but hope to build her up. Bethany had a major seizure on Thursday morning. She was in the bath at the time and lost consciousness, it lasted 2 minutes. She was taken to hospital by ambulance. She had a large one 3 weeks ago and the odd twitch since. She stayed the night and is now home. They are also worried about her weight as she weighs 21kg. Not a lot for a 14 year old. She will now be fed over night by a pump feed. She seems happy now though. Bethany is not too bad at the moment. Her scoliosis is getting steadily worse by the day though. She has changed rapidly since the surgeon last saw her. Life is a bit bitter sweet at the moment as although we do not want Bethany to have any surgery, as she has had 5 in the last five years and all have been major, the sooner the better. This is having such a huge affect on her life as she is not able to do the things she likes to. Her new wheelchair she had in August is a completely different shape to her body, so we are not able to go far. She had a major seizure last weekend and then had several small ones through the day. This is such a shame as she has been very well controlled all but the odd twitch. It has not really come at the best time. She has had a few doctors’ appointments and the most worrying thing about them has been how Bethany has been at the appointment. She has been a very frightened child. She’s been shaking and whimpering throughout, so much so that the doctors decided not to examine her. She had three nights of dreaming in her sleep. She was not waking but crying and moaning out loud. I am very worried about this as I worry it might have a great effect on her wellbeing when she has surgery. She is still at school which is great. She did have a few days off though as she got a very mild infection of impetigo. I’d like to say thank you to Marcen for being a wonderful friend to Bethany. You are truly an angel sent from god to us. Thank you to everyone else as well. I am sorry we have not got back to any of you but our lives are very busy at the moment. Bethany has had a lovely Christmas and was thankfully healthy for the first time in 2 years to enjoy it. Thank you to all of you who sent Bethany cards and presents for her birthday and Christmas. We’d like to wish you all a happy new year. Bethany had her appointment in Bristol and she will be having surgery on her back. She is now on the waiting list for surgery and it should be within the next 6 months. Well she is still in school full time. Which is great, she is enjoying her time there and I do not know what to do with myself. We have an appointment on the 7th of December to see the doctors about her back in Bristol and we are due to see the Orthopaedic doctor on the 8th of December. So we shall have a night in Bristol. It will be good to find out if it is best for her to have surgery or not. She is waiting to see the pain team in our local hospital. We are going to try to work out what is the best way to deal with her pain. She is really looking forward to having a great birthday and Christmas this year as the last two have not been to good due to her being in so much pain. So we hope she keeps on going as she is even though she suffers with pain in her back it is not as bad as she has had in the last two years. Thanks for all the e mails, cards and gifts. Bethany is back at school full time and although she is enjoying being with her friends she is in a lot of pain. We will need to keep a close eye on her. We made it to Orlando and stayed in Disney all star music. The weather was warm. Over all Bethany enjoyed her holiday but sadly she was in a lot of pain. On one occasion we had to sedate her as the pain relief was not working. We did all the disney parks. She really enjoyed the shows. We also did some good shopping. She is now back to school full time and enjoying it. She is at respite at the moment as we are having the bathroom adapted for her. She has a lovely Hydrotherapy bath that fundraisers bought for her. She is on a waiting list to be seen by a back specialist at the Bristol children’s hospital. Sadly her back has got worse and her left leg is also pulling over to the right due to her scoliosis. On the whole she is happy when she is not in pain. Bethany is doing well at the moment. She is starting to put some weight on. She is really excited about her holiday to Florida in 8 days. All keep your fingers crossed for her to stay well for the trip and when she is there. Thank you for the cards and gifts. Thank you Marcene for your continued support. She is a lot better although still a bit tired and in a small amount of pain. has lost a lot of weight. It was a very big shock for us all. Bethany is still at Bristol Children’s Hospital. She has been a very brave girl. She will probably be there for at least another week. She is starting to ask for food, but has to wait until they know her bowel is working. She is much more aware of her surroundings and has listened to lots of stories over the weekend. She is fairly comfortable and we have seen some of her beautiful smiles. Just hoping she will be well enough to come home soon. Hi, this is Bethany’s aunty, just letting you know that Bethany had a three and a half hour operation at Bristol Children’s hospital last night. She had to have her bowel untwisted and part of it removed. She will be at Bristol for a week and probably home then to convalesce. She is more comfortable since the operation but very quiet. Just to let you know Bethany is unwell and in our local hospital. They think her small bowel may of stopped working or that she has a blockage. She will either stay in Treliske Hospital on Fistral Ward or go to Bristol Children’s Hospital. We went to Bristol today to see the orthopaedic surgeon who operated on Bethany in November. He is really pleased with her progress and said he did not expect to see her this well so quick, which is great. We also talked to him about the back surgery. He feels it is the best thing for us to do for Bethany’s sake. He says there is a minimal chance the rods may come lose but no more than anyone else. So we will be going ahead with surgery. We will be having a holiday first though, as Bethany has had 4 major surgeries in 4 years and this will be her 5th in 5 years. We are going to go to Walt Disney World in Orlando. We booked to go in December for her birthday, but will now be going in September as she would of had surgery by December and will be convalescing. Thank you all for your cards and for the lovely ones that were made for the competition. They were all winners in our eyes. We will let you know when she is to have surgery. Bethany has had her plaster off and is back doing 2 hours a day at school. She has a one to one and a special time table due to her being vulnerable. She is enjoying her time at school. We went to Exeter hospital to see the Doctor about her back. She sadly has a 90degree Scoliosis due to having no hip and because when she has a growth spurt her spine could curve any were up to 180degree. She does not sit well at the moment due to pain from her back and difficulty with seating and they are telling us this will get a lot worse. We now have to decide whether to allow them to go ahead with surgery on her back. This would be major surgery and we are at the moment trying to decide what to do. It is not the easiest of decisions we have had to make. Dad thinks we should do it, but I am not sure as Bethany has had a very hard time with the surgery she has had, but I also know life would be very hard for her if we did nothing. We will keep you posted. Thank you all for your letters and gifts. Just a quick update on Bethany. We went to the fracture clinic today hoping to have the cast removed. They did remove it and replaced it with another. A bit of a step back but thankfully all Bethany seemed to be worried about was the colour. After much debate we end up with bright green. So they are saying another three weeks. Oh well, we are all a dab hand with plaster now. We have ordered a cover for it so she can have a bath. She seems happy enough apart from if we go out. Her Scoliosis has gotten a lot worse and she does not sit for very long at all. They are trying to get an appointment with her back specialist. Thank you all for your e mails, post and gifts it really keeps her smiling. Just a quick note to say sadly Bethany has fractured her right leg just above the knee. This happened on monday. She went to theatre on tuesday and is in a plaster cast. This has really set Bethany back as she now does not want anyone to move her. All the work we have put in to build up her trust has just gone out the window. She will be off school for 4 to 6 weeks. She did a week of mornings and now that’s it again. It seems to be 3 steps forward and 2 steps back. Just a quick update on Bethany. First of all her pain in her right hip is getting less and less by the day. She still does not like it moved in certain ways. It is a lot better though. We never thought we would ever be able to move Bethany without her screaming. It is just so great. We are all so less stressed. She still does not sit for very long and by 2pm is normally having her daily nap. We went to Great Ormand Street Hospital and they were pleased with her although she has not really put any weight on. Much to be expected for all she has been through, although she seems to be eating chocolate a lot. We have to go back in a year. We are due back in Bristol for check up in July. It is amazing we do not have an appointment for 5 months. Never been heard of before. We have just booked a treat for her for the end of the year. She will be going to disney for her birthday. Thanks again for all the mail and gifts she receives. She gets the most mail now. Bethany went for her out patient’s appointment at Bristol children’s hospital. They are very pleased with her progress and the fact that she can now move her leg. She was not able to do this for over a year due to the original surgery going wrong. They said still to expect some pain. We will be going back in July. We are due to go to Great Ormond Street hospital on Tuesday for a check up on surgery she had in 2002. She started part time school two weeks ago. She did two mornings but then sadly got the flu. She has been quite poorly for the last week but is slowly on the mend. Take care and thank you all for you cards, gifts and e mails. They really help to cheer her up. Just a quick update on Bethany. She has had her Spika removed. Sadly she is in a lot of pain and this has really knocked her confidence. We are due to go to Bristol the end of the month and are hoping this is normal and the surgery has worked. We were only given a 50% chance it would work so fingers crossed. She would like to thank everyone for the e-mails and the gifts she has received. It has put a smile on her face.